The comprehensive Travel Planner has everything you need to plan the perfect trip. Including some great tips to help you use the free calculator, this document is designed to be intuitive and quick to use. We all dream about traveling the city of Paris or even just backpacking across the Rockies. These dreams are more affordable than you might think and when you start to organize these goals, the dream starts to take shape. This free document was made to help you along your journey so you can travel where you want, when you want, how you want. You can get started today by following the guide given below. To download the free template, all you need to do is click the link that we have provided for you at the bottom of the page. The template was designed to help you track all the important things for a trip. The categories are organized by gas, airfare, meals, and lodging. All you need to do is go through the items and fill out your own information. Take a look at the examples in the template to see how you should be suing this document. Enter the total # of travelers & the length of trip in days. Enter the amount for the expense type and select yes/no from the drop down list whether to add that expense or not. You’ll get the total trip cost and cost per person calculated for you.4.Mobile friendly. Once you finish all the instructions above, you’ll have a detailed list of your entire trip. You can start to see how simple and easy to use this free template can be. 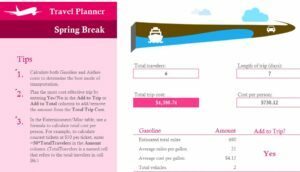 If you’re ready to get started with your free travel planner template, then follow the link at the bottom of the page.